At less than £40, is the Aldi Gardenline BBQ Pizza Oven really a great deal? 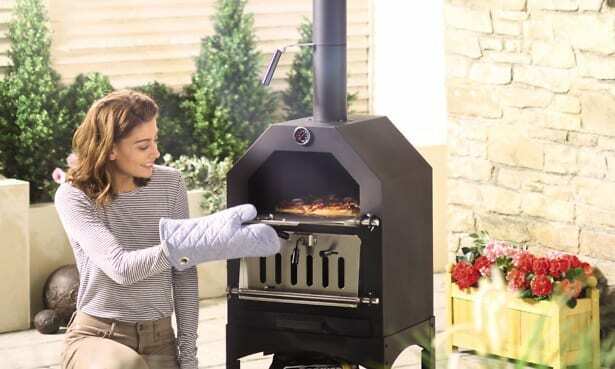 Story update: 1 April 2019 – This same Aldi pizza oven will be back on sale in Aldi from 4 April 2019 – you can pre-order it online from 31 March 2019. Last year, Aldi’s budget pizza oven caused a furore when it was released in UK shops. This year it is looking like Aldi’s new barbecue pizza oven will follow suit. Unlike the previous standalone oven, this one needs to be used with a barbecue, either gas or charcoal. 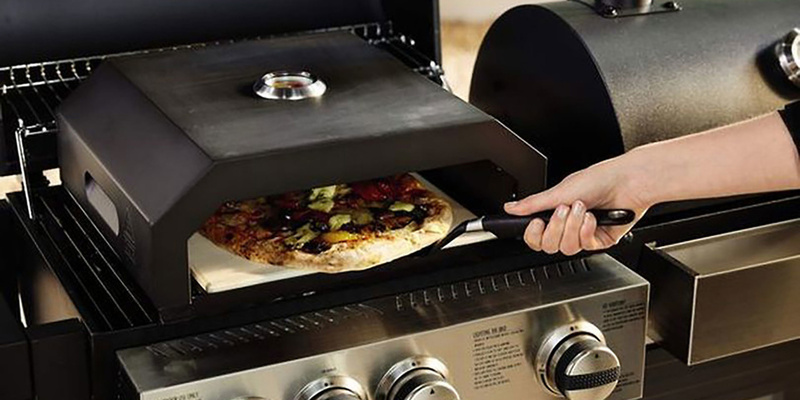 It sits on top of the barbecue and uses its heat to cook your pizza. Read on to find out more about Aldi’s BBQ oven, as well as our expert view on last year’s model, having tried it out. If you don’t yet own a barbecue and are considering buying one, then head over to our advice on how to buy the best barbecue. Aldi claims that its Gardenline BBQ Pizza Oven can cook a 12-inch pizza in 10 minutes. You do this by placing the pizza oven (complete with pizza stone) on your barbecue’s grill. 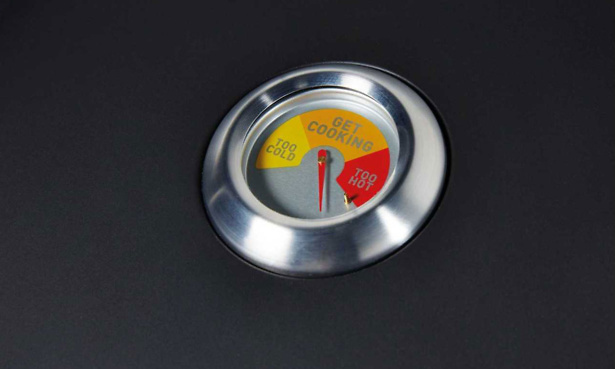 The temperature gauge on the top will indicate when the pizza oven is at the right temperature to put your pizza in. The oven measures 15x40x35cm (HxWxD), so you’ll also want to make sure that your barbecue is large enough for it to sit on. Unlike last year’s version, the barbecue oven requires no assembly and is very portable and light. It is constructed from stainless steel, carbon steel and ceramics and comes with a three-year warranty. If you have a bit of a sweet tooth, Aldi says you can also use the Gardenline BBQ Pizza Oven to make cookies, as well as flatbreads and for searing meats and fish. How well the Aldi BBQ Pizza Oven works will, in part, depend on the quality of the barbecue it will sit on, so you might want to make sure that your barbecue is up to scratch. To get the best barbecue for the job, check out or list of top-scoring Best Buy barbecues. Last year we tried out Aldi’s Gardenline Pizza Oven, which was similar in style and construction to this year’s offering. As you would expect from something so inexpensive, the build felt rather cheap. While it was easy to assemble and use, it already appeared a bit battered and used before we had even started cooking. None of this would have mattered, of course, if the pizzas had been spectacular every time. The first was great – light and crispy in just a few minutes. However, the second was not as impressive – it looked good on top, but was totally charred underneath. Aldi’s pizza oven had a massive cost advantage over rival pizza ovens – at £99, it was significantly cheaper than other standalone pizza ovens on the market. Aldi and Lidl offer a wide variety of seemingly great bargains with their own versions of popular products. These supermarkets release highly coveted items, such as barbecues, coffee machines, juicers and bullet blenders, at prices that put the competition to shame. With a limited number of products available for a short period of time, they tend to create a lot of buzz and fly off the shelves almost instantly. If the product can stand up to the best, then it might be worth enduring the crowds to snag a bargain that could save you a lot of cash. But if it’s a flop, you’ll have wasted time, effort and money. We have tried out many Aldi and Lidl products, so before you brave the maddening crowds, get informed on how they generally fare against the competition by visiting our shopping advice on Aldi and Lidl offers.